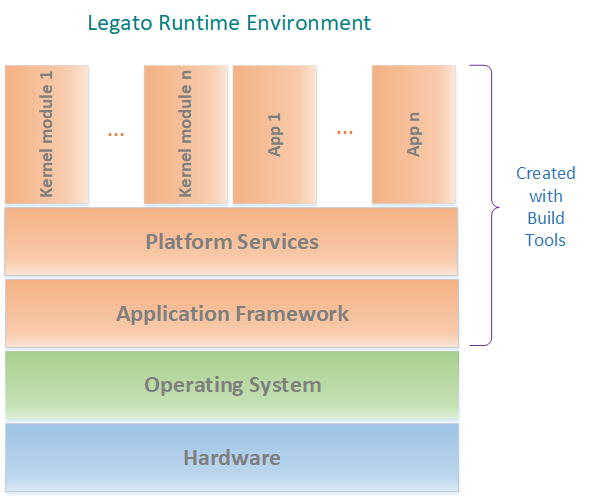 The Legato Application Framework is a set of tools and design paterns that enable developers to focus on building applications. The Legato Application Framework simplifies the complexity of interfacing with the underlaying Operating System and hardware, and introduces layers of security that ensure that applications only have the permissions and access to the resources that they need. Applications run in an isolated environment and their permissions can be explicity configured. The ability to plug in applications/services provided by your target provider or other developers that you can then take and connect to your own applications. Dig further and discover our development concepts, API Guides for our core daemons and platform services, or our tool box that contains tools to help you configure and run the Legato Runtime Environment and the underlaying platform.